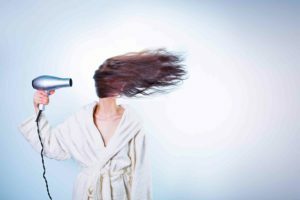 Particularly if a hair dryer is part of your daily routine, it may be more damaging to your hearing than you think! When we think of noise pollution, we often think of sounds beyond our home. From the sounds of traffic to construction sites, noise pollution is typically categorized as an external force that can pose negative effects on our ability to hear over time. However, there are many sources of noise pollution within our homes that can damage our hearing as well. Consider these five sources of excessive noise that may be harming your hearing from inside your home. Your television can easily become a source of noise pollution, particularly when your TV is left on as background noise throughout the day or evening. While watching television is not necessarily dangerous, leaving your TV on with the volume up as you are sleeping can be harmful for your hearing over time. For many, hair dryers are staples of a morning routine. However, this daily dose of loud, continuous noise can be especially harmful on your hearing each day. Particularly if a hair dryer is part of your daily routine, it may be more damaging to your hearing than you think! Much like your television or your hair dryer, your washing machine is a continuous noise that can often be hard on your hearing. While the sound of your washing machine may not be quite as loud as your hair dryer, it can damage your hearing as a continuous noise in your home. Kitchen appliances such as blenders, food processors, and microwaves all produce loud noise that can be especially damaging to your hearing. Although using kitchen appliances is often unavoidable, it is important to limit your exposure to their sounds, particularly in the evening as you are relaxing for the day. While your vacuum is a necessary cleaning tool for your home, it can also be a source of loud, harsh noise that contributes to noise pollution in your living space. With this in mind, it is important to avoid excessive exposure to sounds such as your vacuum during the week, and designate only specific days of the week or month to cleaning. This entry was posted on Friday, February 8th, 2019 at 5:08 pm. Both comments and pings are currently closed.